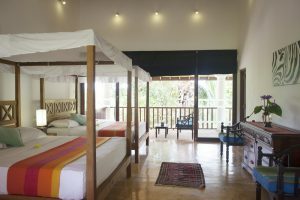 Ratnakara boasts five spacious, beautifully appointed bedroom suites; four king-sized double twin rooms and one triple with three single beds. 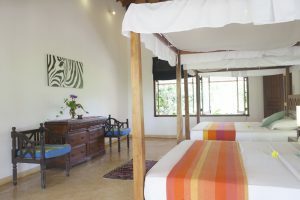 Amethyst, the largest of our rooms, is a ground floor bedroom suite that leads off from the main downstairs sitting room. 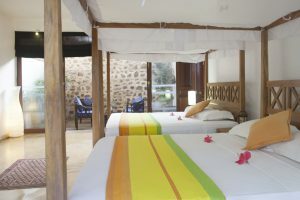 It is furnished with two king-sized double beds. 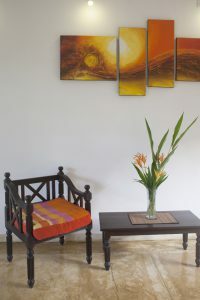 Amber is a first floor double bedroom suite with high wood-panelled ceilings and is accessed from a large open-sided shala. 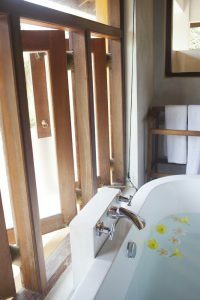 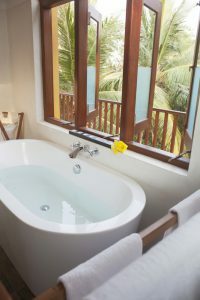 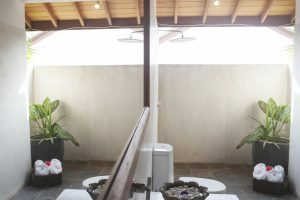 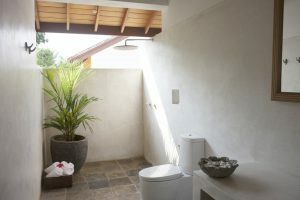 A walk-through dressing room leads to a walk-through bathroom with free standing bath looking out to the jungle and beyond is an outside rainforest-shower. 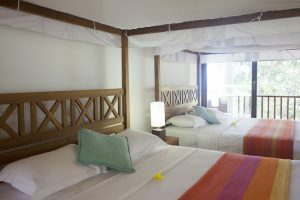 Amber is furnished with two king-sized double beds as standard. 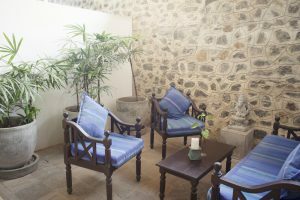 Garnet is a first floor double bedroom suite which is entered from the upstairs open-sided shala. 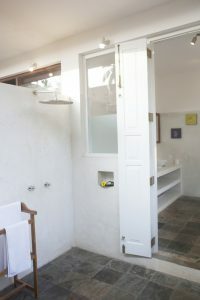 This spacious room has high wood-panelled ceiling and a walk-through dressing room leading to a large shower room. 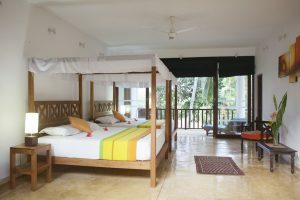 Garnet is furnished with two king-sized double beds. 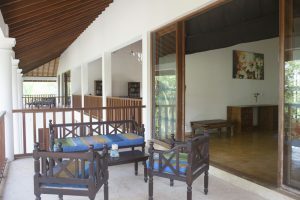 Garnet’s large balcony overlooks the swimming pool area and beyond to the jungle and the ocean crashing on the beach below the house. 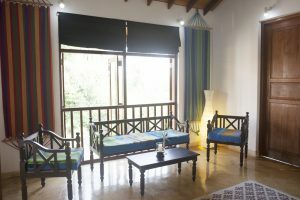 Sapphire is a first floor double bedroom with high panelled ceilings entered from a large open landing. 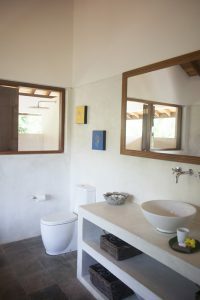 Sapphire is a spacious, light-filled, en-suite bedroom overlooking the lily pond and with views inland over a clearing to paddy fields and the jungle beyond. 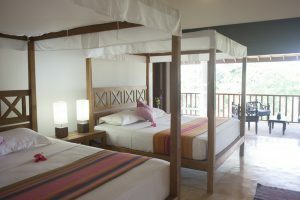 It is furnished with two king-sized double beds. 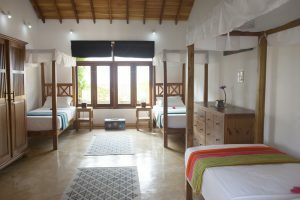 Sapphire has interconnecting doors with our triple room, Emerald, which when opened make the two rooms an ideal suite for a families or friends. 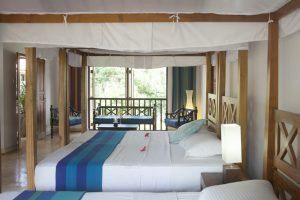 Emerald is a triple-bedded, en-suite first-floor room entered from a large landing over looking the lily pond. 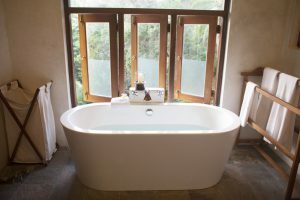 Emerald is a bright, spacious room with an outside rainforest shower and views to the herb garden and onto the lily pond. 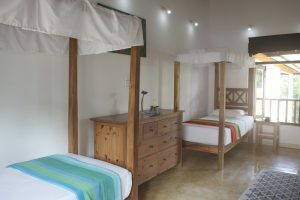 It is furnished with three single beds as standard, perfect for children. 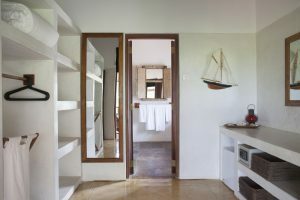 Emerald has interconnecting doors with the double room, Sapphire, which when opened make a lovely suite for families or friends.